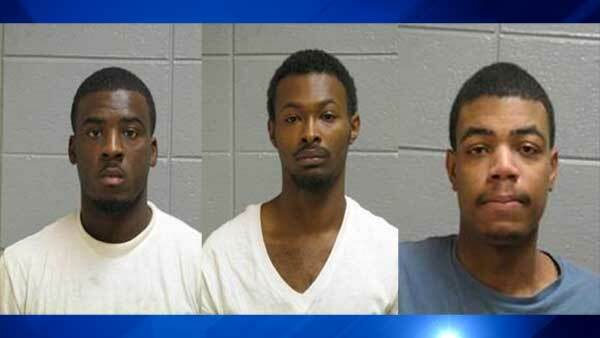 SOUTH HOLLAND, Ill. (WLS) -- Three Dolton men were charged in connection with the shooting death of a 42-year-old man during the attempted robbery of a home he was rehabbing in south suburban South Holland. On June 19, Sergio Varela was doing electrical work at a home near East 157th and State streets with two other workers. Police said three other men walked up to the site and apparently asked if any help was needed. When they were told no, they barged in. Varela was fatally shot in the head. Police said the suspects took off in a four-door vehicle. Police are searching for a gunman who killed a construction worker during an on-the-job robbery in South Holland, Ill. on Friday. On Aug. 18, investigators identified Keyada Salaam and Dontrail Anderson, both 21, as suspects and took them into custody. Police said investigators recovered the murder weapon and the getaway vehicle. An arrest warrant was issued for a third suspect, 21-year-old Cedric Williams. Salaam, of the 15100-block of Oak Avenue in Dolton, and Anderson, of the 15300-block of Oak Avenue in Dolton, were each charged with first-degree murder, armed robbery with a firearm and attempted robbery with a firearm. On Aug. 20, Salaam's bond was set at $500,000 and Anderson was issued no bond. On Sept. 17, investigators located Williams in East Chicago, Ind. Williams was taken into custody and transferred to the Hammond Indiana Police Department, where he gave a videotaped statement implicating himself in Varela's murder. On Nov. 23, Williams waived extradition and was taken to the South Holland Police Department. He was identified as the third suspect in a physical lineup. Williams, who lived on the same block as Salaam, was charged with first-degree murder and attempted armed robbery. Williams received $300,000 bond in court on Wednesday. Neighbors said they were shocked by the shooting, because it occurred in the middle of the day in a house on a busy street, a block away from South Suburban College. The victim's brother, Jose Varela, said his mortally wounded brother fell at his feet after he was shot. Jose Varela said his brother was a great person who was special, helped everyone and was loved by all.